Good Luck Coach Daboll on your first game as a Buffalo Bill this Sunday! Well worth the 4 minutes. Loved Coach McDermott's quote about Coach Daboll understanding the fundamentals and technique of every position on offense. Nice piece. Hopefully this hard work actually produces noticeable results on the field. I have high hopes for Brian Daboll. I just hope he gets a chance to stick around for a while even if the offense struggles a bit this year. I think it’s important for the offense as a whole, and specifically the QBs (especially Josh Allen) to have continuity. I don’t want Josh trying to learn another new system next year. There isn’t a whole lot of faith from the national pundits regarding the offensive fortunes of the Buffalo Bills in 2018. Whether their analysis has any merit is inconsequential to the players in Buffalo’s locker room. They believe in the talent they have on the roster, and they are resolutely confident their offensive coordinator will put them in position to succeed. Brian Daboll has come in as Buffalo’s new offensive play caller and made a dramatic impression. He came to the Bills with quality credentials having worked under one of the best college coaches in the game in Nick Saban, and one of the best NFL coaches in the game in Bill Belichick. However, once Daboll arrived at One Bills Drive, he still had to prove himself. The one thing I especially like about the pieces, is the comment that with Beane, McDermott and the Pegulas, the organisation is set up in the right way, with everyone pulling together. As he is a guy who spent a lot of time with the Patsies, that, to me, says we should be on the right track, if not this year, then within a couple. Couldn't help laugh when he called Austin Ricky. I wish I was friends with Bill Polian’s son. 😢 and I hope he will do a great job but his resume is worse than Rick Dennison’s. But if we call Daboll out, noooo, you don't know what you're talking about. Dude couldn't figure out how to get a receiver open in 5 yards. No slants, no outs, nothing. And I don't care what anybody says, he abandoned the run. Actually, he never even tried to establish the run, surrendering before the game even started. In the first half, we had 5 runs to 8 passes at one point, then it was 7 runs to 13 passes. ARGH!!!! He'll have to do better with play design and scheme because the talent by itself won't beat many defenses. ORCHARD PARK, N.Y. — It’s Friday afternoon about 48 before Josh Allen is set to make his debut as the Buffalo Bills’ starting quarterback. Brian Daboll, the man in charge of Buffalo’s offense, strolls through the tunnel at New Era Field with a smile, beads of sweat dripping down his head. Maybe it’s been a long week of preparing a rookie quarterback to start his first NFL game, but you wouldn’t know it looking at the Bills’ offensive coordinator. He’s done this a few times before. Daboll coached 15 quarterbacks with four different teams during his time as an offensive coordinator and quarterbacks coach before joining the Bills in January. But none came with the hype that surrounds Allen, who is the highest draft pick both the Bills and Daboll have ever had at the position. Daboll was the Jets quarterbacks coach at the tail end of Brett Favre’s career and an offensive coordinator for the Browns, Chiefs and Dolphins, guiding a list of quarterbacks that includes Brady Quinn, Matt Moore and Colt McCoy. He has never worked with a great QB before. By far Allen is the most talented QB he has had to work with but he also is a rookie so there will be a lot of ups and downs. 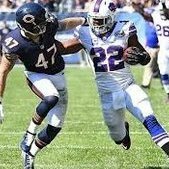 The rest of the offense sans Shady is pretty much a black hole tho so again he is in a position where he doesnt have much to work with.